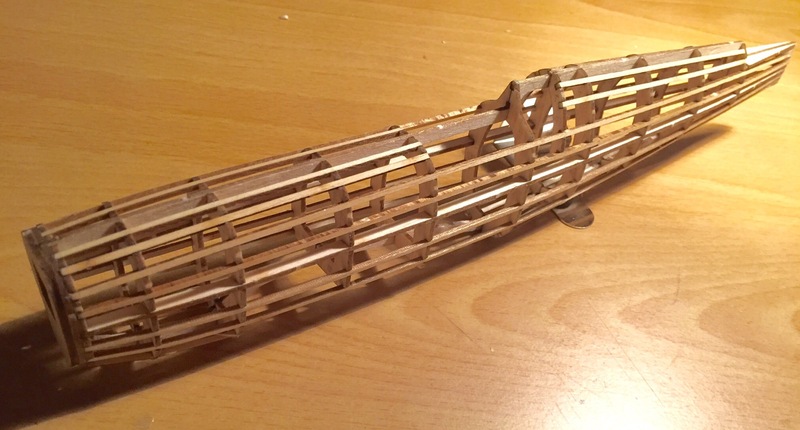 The fuselage, wings and tailplane have all been covered with tissue. The surfaces have been sprayed with a light mist of water and allowed to dry – this causes the tissue to shrink thus tightening the surfaces. The various parts have been assembled and the gaps between the components have been infilled. The propeller has been fitted into the spinner and the assembly attached to the fuselage. The minor parts (radiators, exhaust pipes, etc) have been glued in place. The canopy has been cut out from the rough moulding and glued in place. So the model is almost complete and beginning to look more like an aircraft. It is now ready for painting. You can see where the nose covering is a composite of paper and tissue, this is for strength. In the case of my model it’s probably not necessary because I have not installed the motor as I’m not going to fly it. So here are the spitfire parts after I’d attacked them with the glasspaper. You can’t really see much difference but they are the correct shape now. Approximately. I’ve been constructing more small parts for the Spitfire build. Everything starts off laser cut from flat sheets of balsa, so items thicker than that are made up by laminating 2 or more parts together. For added strength some of these laminations are cross grained. Once the glue has hardened, the part can be shaped to achieve the desired profile. For this I’ve been using a combination of modelling files, scalpel and fine glass paper. From left to right: Undercarriage assembly (with the legs and wheels already shaped), Oil cooler, Air intake and Radiator. Above those are the exhaust pipes. All these have yet to be sanded to the correct shape. The big radiator was a bit of a pig, as you can see it is curved and the flat rectangular panel has to be glued to the curved sides to create the correct shape. Of course the balsa has a natural desire to stay flat, so it has to be clamped onto the sides by hand until the glue sets. This proved impossible as for once the PVA refused to hold and the panel kept pinging off. After a couple of goes I grew impatient and resorted to using cyano adhesive. Job done! Not shown here is the propeller assembly which has also received some attention. I’m nearly ready for the next major milestone: covering the airframe. Can’t wait! Recently just some sporadic work on the Spitfire build. I’ve been making up some small parts: the nose assembly and the wheels. These have been made by laminating sections and then sanded the finished article to shape. The nose had to be sanded to blend in with the front of the fuselage which was not easy as it has to be done ‘by eye’. Although the plan has a cross section this is only in one dimension and is thus more of a guide than anything. I had rediscovered a set of modelling files which I bought many years ago and these have proved very useful. I used a scalpel to remove the bulk of the unwanted material, then used the files to get the basic shape, then glass paper to complete the job. I’ve also cut lengths of piano wire and bent them into shape, these will be the strong parts of the undercarriage. The other thing I’ve done is research the paint scheme I want to use. I’m not going to fly the Spit once I’ve completed it (I couldn’t deal with the inevitable damage from the crash landing following her first flight!) so I don’t have to worry about whether painting would add too much additional weight and cause aerodynamic problems. One more thing. Piano wire has very sharp ends. Tricky bit, the fuselage. I started by building up the left side on the plan. Here’s the keel and formers. Once all the stringers were in place, it was released from the plan and the right side built onto the completed left side. I ended up with this. Time to let everything harden off before tidying it up and starting work on the nose, then sanding, etc.. I’ve had to develop a very gentle touch as the wood snaps extremely easily! Actually, no. I stuck to the plan. Both wings now done.